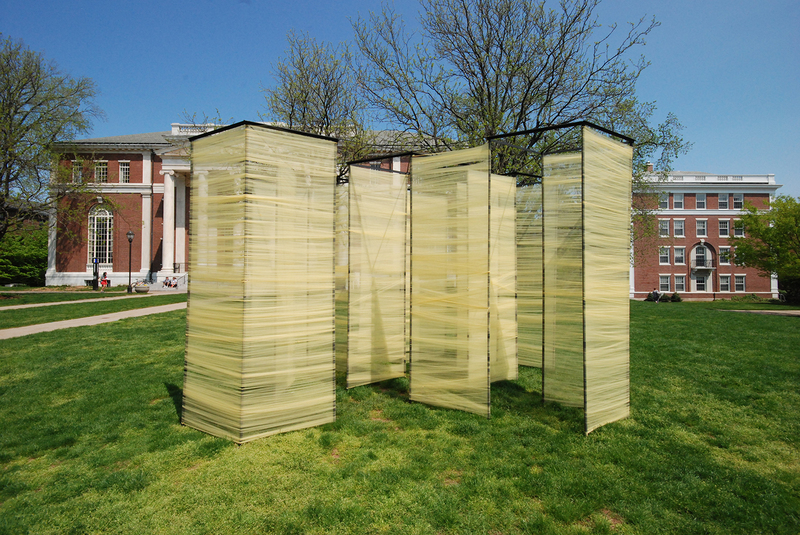 Students enrolled in Wesleyan’s Architecture II class designed and installed an exhibit titled “Confession” in front of Olin Library. Ten Wesleyan students enrolled in the Architecture II course designed and built a new chicken coop for Long Lane Farm. 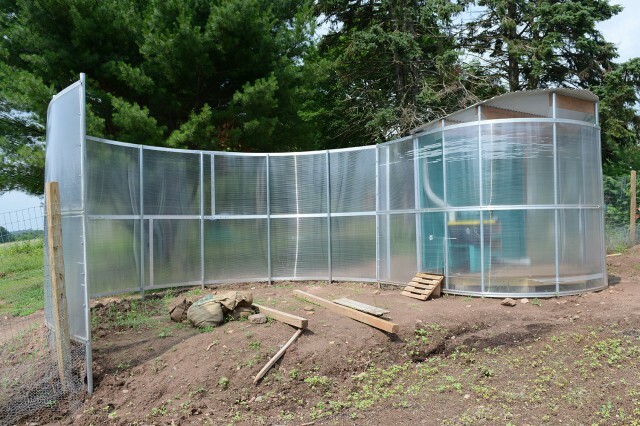 A fence will complete the left side and protect the chickens from predators. A flock of feathery friends will soon join the student staff at Long Lane Farm. Each year since 2006, Wesleyan’s Architecture II course, taught by Associate Professor of Art Elijah Huge, has accepted a commission to work on a project, traditionally for a nonprofit organization. 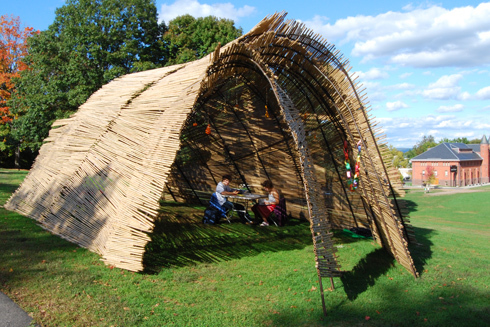 Past projects have included the Wesleyan Sukkah, a wildlife-viewing platform for the Audubon Society, and a pavilion for the Connecticut Forest and Parks Association at its headquarters. This year, the idea for the project came from Long Lane Farm and Bon Appétit: to design and build a chicken coop that would enable Bon Appétit to serve locally harvested eggs at Usdan University Center. First, the class spoke to chicken experts about the health and psychology of feathered fowl. 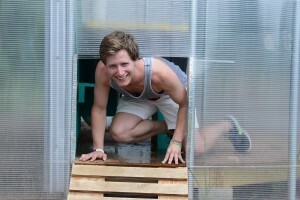 Jessup Smith ’14 crawls through the coop’s entryway. After researching the quirky psychology of chickens, the students began designing the coop. The class began by discussing basic coop requirements with members of the Long Lane Farm. 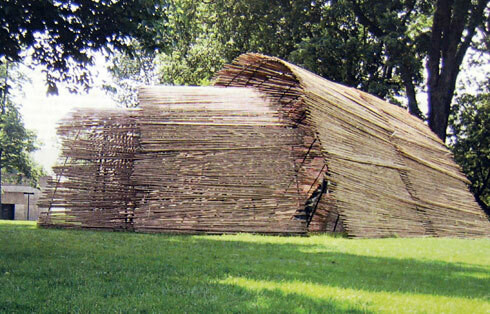 Topics included green power, free-range area, structure mobility and overall functionality. The class split up into three groups to fully explore its options. Each group brainstormed about a design for a different frequency of mobility, either stationary, seasonal, or creeping with a weekly movement. 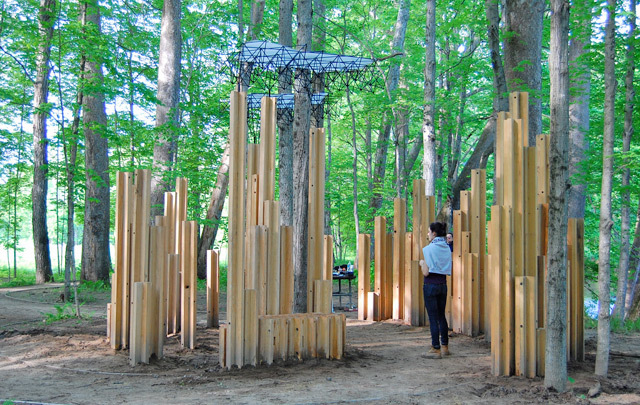 Wesleyan's faculty-student design collaborative North Studio created a bird-viewing structure inside a 700-acre nature preserve. 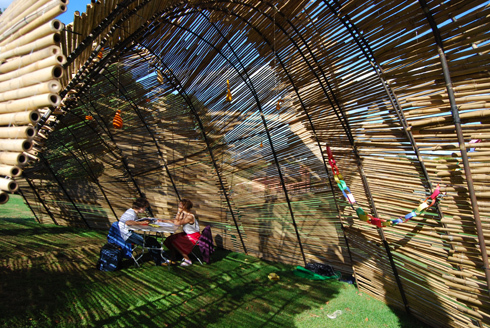 The bird blind serves as a viewing platform, a resting station and shelter for visitors. Lots of people like watching birds. Understandably, birds don’t always like people watching them. For the Audubon Center at Bent of the River, a 700-acre nature preserve in Southbury, Conn., this presented a problem: the swallows and kingfishers along a popular trail were perpetually startled by human visitors. Assistant Professor of Art Elijah Huge and the 11 students in his Architecture II class devised a solution – a chic bird blind they designed and built from scratch. 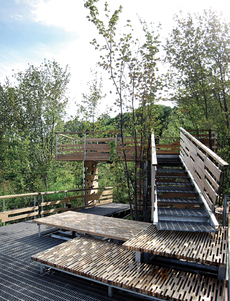 The structure represents the third major design-build project for North Studio, a faculty-student design collaborative Huge founded in 2006 that is cultivating a niche in architectural design for nature preserves. 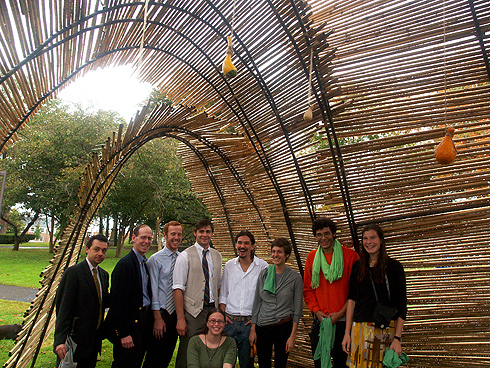 Previously, Huge and his North Studio students, who are as likely to major in sociology or German studies as in studio art, conceived and built an award-winning multi-level bird-viewing platform for an Audubon Society sanctuary in Portland, Conn. A subsequent iteration of the class designed and built a Sukkah, or temporary Jewish ritual structure, at Wesleyan. Connecticut Governor M. Jodi Rell and the Connecticut Department of Environmental Protection (DEP) recently commended Elijah Huge, assistant professor of art, on his efforts with the Mattabeseck Audubon Society. Rell presented the Audubon Society with GreenCircle Award. The Society was experiencing problems at their Helen Carlson Wildlife Sanctuary in Portland, Conn. with beavers who had changed the site so that access was a serious challenge. The Audubon Society welcomed Huge and his Wesleyan students to solve the problem. 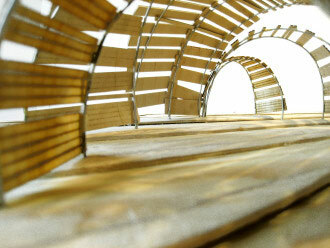 SplitFrame, designed and built by Elijah Huge's students, received a GreenCircle Award Dec. 16. They designed and constructed a sustainable project under adverse conditions. They created a split frame viewing station consisting of a lower floating observation deck and an elevated platform connected by a hinged staircase. Tiers on the lower platform serve as seating for conducting classes. Through their architectural skills, professionalism, and dedication to the project, the sanctuary is once again available for a unique environmental experience. Rell awarded 17 Connecticut civic organizations, individuals and businesses with GreenCircle Awards at a ceremony at the State Capitol in Hartford Dec. 16. As part of the Grand Concourse Beyond 100 urban planning project, Angus McCullough '10 designed the MTA "Skyway." By using cameras and projectors, the Skyway renders the sidewalk transparent, enabling passengers to see the sky from the platform below or an approaching train from above. McCullough is participating in an exhibit titled “Intersections: The Grand Concourse Beyond 100,” at the Bronx Museum of the Arts. A result of a nine-month competition sponsored by the museum and the Design Trust for Public Space, the show focuses on seven visions for the future of the Grand Concourse in the Bronx that range from urban farms to high-tech sound barriers for a nearby freeway. McCullough’s proposal, “Live Wired,” would create video and audio installations in strategic points along the Concourse. Read more about McCullough’s project in this Sept. 3 Wesleyan Connection article. 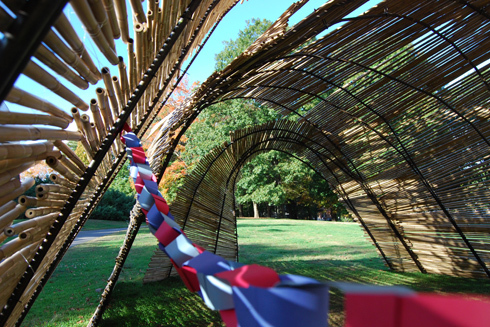 WesSukkah, designed and built by Wesleyan’s Architecture II research-design-build studio, was dedicated Oct. 3 on Foss Hill. 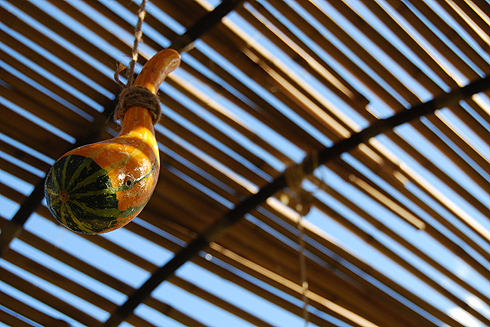 The sukkah is used by Wesleyan’s Jewish community during the festival of Sukkot. For eight days, students studied, socialized, mediated, ate, and occasionally slept in the religious structure. 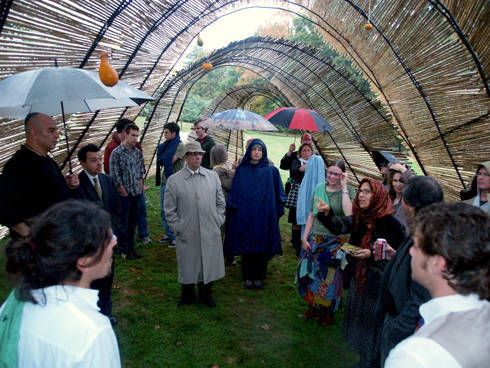 WesSukkah was honored with a 2009 “Faith and Form” Award for art and architecture from the American Institute of Architects. Brooklyn, N.Y. native Angus McCullough ’10 envisions the thriving community living on Bronx’s Grand Concourse connected with a web of speakers, microphones, projectors and cameras. As one of seven finalists, who placed third out of 400 entrants, in the Intersections: Grand Concourse Beyond 100 urban planning project, McCullough designed an audio-visual nervous system for the Grand Concourse, using nodes to weave the long, thin boulevard into a tight-knit web of interaction. His project, titled “Live Wired,” landed him a $1,000 cash stipend to further develop his proposal for inclusion in the exhibition Intersections: Grand Concourse at 100 — Future at The Bronx Museum of the Arts,, which opened Nov. 1, 2009. Designed as a wide, tree-lined thoroughfare with carriage drives, bridle paths and sunken cross-streets, the Grand Concourse was conceived in 1870 by engineer Louis Risse as a means to connect Manhattan to the parks of the Northern Bronx. Today, the Grand Concourse hosts the largest collection of Art Deco and Art Moderne style buildings in America. 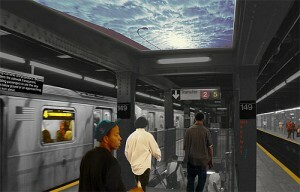 McCullough’s plan involves the installation of interactive nodes to connect disparate spaces along the four-mile-long Concourse: The Metropolitan Transportation Authority (MTA) mutual intercom connections (m.i.c. ), would allow riders waiting at subway or bus stops to talk to each other, find out how crowded the bus or train will be, when it will arrive or to pass the time. Similarly, the Bodega Broadcast Network, installed near delis and grocery stores, would turn the concourse into a giant speaker system. A service project undertaken by Wesleyan students for the Helen Carlson Wildlife Sanctuary in Portland, Conn. has drawn the attention of journalists. A piece title “Bird-Watching Deck Built with Respect for Environment appeard in the Oct. 19 Sunday Hartford Courant: http://www.courant.com/features/hc-fancybirders.art0oct18,0,3286282.story . Another piece titled “Eye Candy: Bird-Watching in High Design” ran in the Oct Chronicle of Higher Education: Chronicle of Higher Education blog . 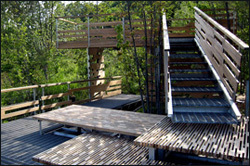 The design and building of the structure, which was part of the Feet to the Fire project was detailed in the Connection: http://newsletter.blogs.wesleyan.edu/2008/09/23/students-create-innovative-structure-for-audubon-society/ .